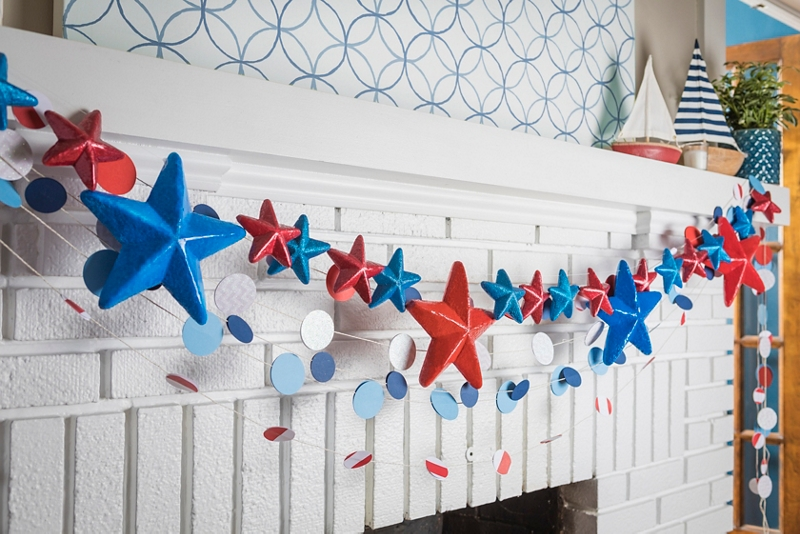 Add red, white, and blue in various Krylon® finishes to your mantle or party table! On a covered surface in a well-ventilated area, lay out all craft foam stars, with enough distance in between each to avoid overspray. Spray the large stars with Krylon Craft Foam Primer and allow to cure for 48 hours before topcoating. Once fully dry, divide the total amount of large stars in half and paint one half with Krylon ColorMaster Paint + Primer in Gloss True Blue and the other half with Krylon ColorMaster Paint + Primer in Gloss Banner Red. Allow the stars to fully dry and then flip over and paint the other side. Spray half of the small stars with Krylon Shimmer Metallic in Candy Apple and the other half with Krylon Glitter Blast Paint in Sapphire Shimmer. Allow the stars to fully dry and then flip over and paint the other side. Please note, although Krylon Shimmer Metallic and Krylon Glitter Blast products are craft foam safe, the use of Krylon Craft Foam Primer is optional to achieve a smoother surface and a truer topcoat color. If using Krylon Craft Foam Primer, allow the primer to cure for 48 hours before topcoating. Once all stars are fully try, take a needle and thread the fishing line/ribbon through the top of the stars to string them together. Leave extra fishing line/ribbon at each end to hang the garland on a mantle or party table.